Moonstone is a variety of orthoclase feldspar, which is a sodium aluminum silicate. Moonstones can occur colorless, blue-wjite, white and pale shades of apricot and peach. The rarest and most expensive moonstones will be colorless with a floating blue color or schiller that seems to hover above the stone. This phenomenon is termed adularescence and is due to a combination of orthoclase and albite feldspars, arranged in layers. Light reflected from these layers produces interference effects and causes the adularescence. If the layers are very thin, a blue schiller is seen; when they are thicker a white schiller is seen. The most important source for moonstone is Sri Lanka. Water-worn stones are often found in the alluvial gem gravels on the southern part of the Island. The Romans, from about 100 A.D, used moonstone in jewelry. They believed that the stone was formed from the light of the moon. Moonstone is considered a sacred stone in India, where it was believed that moonstones placed in the mouth during a full moon would allow you to correctly envision the future. Until the 1800's, moonstones were believed to make people invisible, permitting only their spirits to wander. Variations of that belief still exist today. Its been claimed that moonstone can lead to psychic immortality because it fortifies the spirit to stand alone from the body. 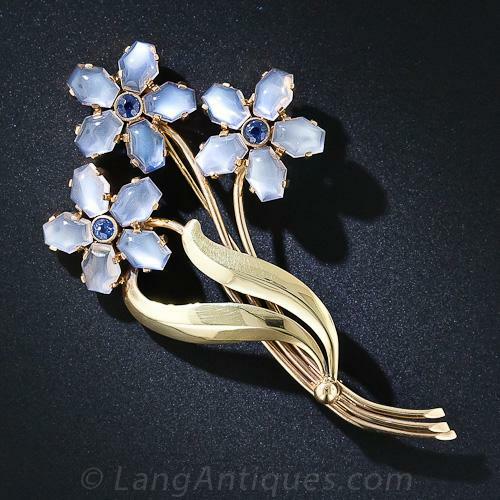 Moonstone was a favored gem by Art Nouveau designers including Louis Comfort Tiffany. Moonstone is a stone of wishes, insight, intuition and balance. It is often considered a feminine stone, but it can aid both men and women in fostering gentleness and empathy. In eastern cultures, it was believed that carrying a moonstone would bring love into your life. It is a stone of fertility, which also applies to gardening. Moonstone protects a traveler, especially on water. Similar Stones: Moonstones can be confused with adularescent glass, synthetic spinel that has been schillerized by heating, and white chalcedony.